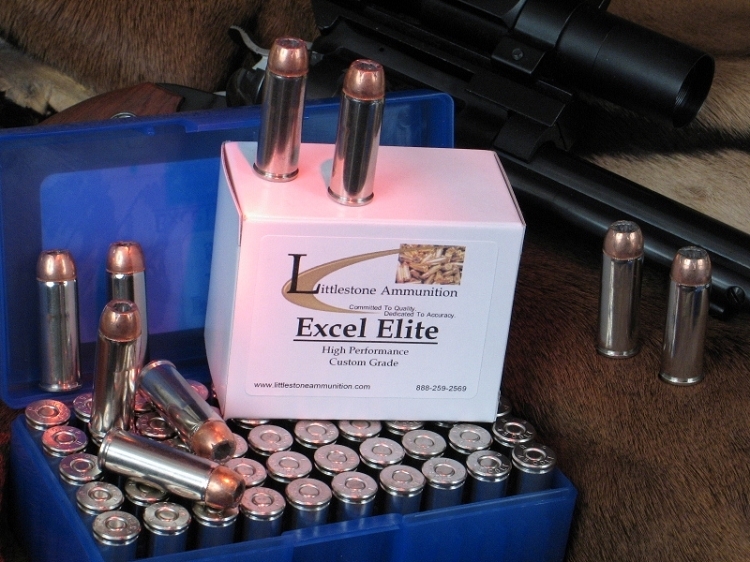 A generic photo of 20- and 50-round boxes of Littlestone Ammunition. Hover cursor or click on photo for close-up view. Firearm not included. When you want to be absolutely sure of the power and accuracy of your .454 Casull when in the game fields, first use absolutely reliable ammo. Littlestone Ammunition, offering reliability of true custom-quality consistency and quality control. Your .454 Casull is only as good as the ammo you feed it, and the quality packed into this Littlestone Ammunition REALLY counts in your favor when the opportunity of a lifetime is standing in front of you. This 20-round box features 300-grain Speer Gold Dot DEEP CURL bonded-jacket hollow point bullets with a muzzle velocities of 1,630 fps and 1,730 ft pounds of energy. Gold Dot bullets are bonded Uni-Cor hollow points, in which the jacket is built up on the lead core chemically, one molecule at a time, rather than being put in place mechanically, which can lead to jacket/core separation. The bonding process virtually eliminates the possibility of jacket/core separation. Many are intended for self defense, others for hunting. The hollow point versions are manufactured in three steps. First the core receives the bonded jacket; next an oversize hollow point cavity is installed with predetermined expansion folds; and lastly the final cavity shape and volume are set for the optimum performance for the cartridge and intended use. It typically retains about 95% of its weight through impact. This bullet was designed with a wide hollow point to give maximum opening regardless of velocity and delivers tremendous hydrostatic shock at .454 Casull velocities. Click on the "Add To Cart" button above now to purchase this 20 rounds of Littlestone Ammunition. Feature 3: MV / Energy / Barrel: 1,630 fps / 1,730 ft lbs / 7.5"